NVMe over Fabrics flash array startup E8 says its box out-performs Dell EMC and Pure arrays by up to 20 times. E8 is now selling and shipping a 2U by 24 NVMe SSD and NVMe over Fabrics-accessed array, with dual controllers and some logic agents in the accessing servers. It provides a claimed 10 million IOPS with 100 microsecond latency. The array is actually just a bunch of flash drives and uses dual-port 6.4TB NVMe SSDs, the first such array in the storage business. It took the benchmark Dell EMC used to trounce Pure, and which Infinidat later used to trounce Dell EMC, and trounced the lot of them, according to results shown on a presentation slide to a press tour in Silicon Valley. The test looked at IOPS with an 80/20 per cent read/write mix and 8K or 16K block sizes, the bandwidth with 256K blocks, and steady-state latency. 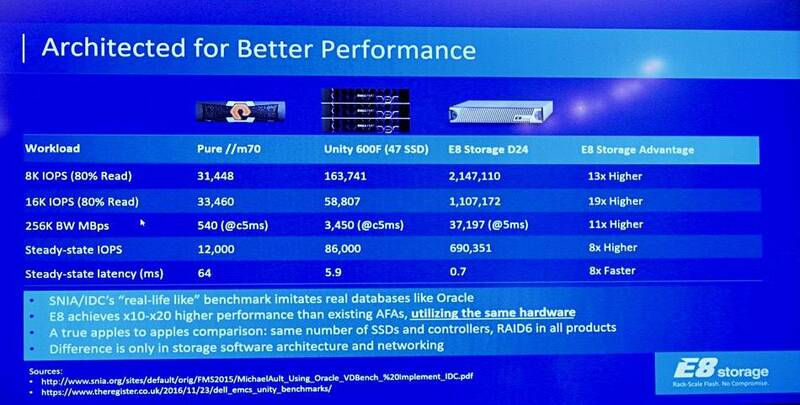 The E8 storage advantage column lists numbers describing how much faster the E8 D24 array was than the Dell EMC Unity 600F array. So, for 8K IOPS with 8 per cent read, E8's advantage was 13X. Its advantage over Pure's FlashArray//m70 was 68X. At the 16K IOPS level E8 was 19X faster than the Unity array and 33X faster than the Pure system. You can read the other results yourself; 11X higher, 8X higher and so on. E8 didn't compare its D24 product against Infinidat, but we can. On the 8K IOPS (80 per cent read) test Infindat's F6K scored 347,100 – E8 is 6X faster. With 256K BW MBps Infinidat achieved 10,024 and E8 37,197 – 3.7X higher. E8's steady state IOPS were 690,351 and Infinidat's 192,000 – 3.6X slower.